- Fits in the Super Satchel Cube (6855SC). - Extra depth allows for storage of larger, bulkier supplies. - Area on dividers accommodates standard size address labels to ID contents of each section. Perfect for Artists, Illustrators, Architects or Hobbyists! Tube is Water and Light Resistant - It Protects Materials Against Fading. This Versatile Tube Has Unlimited Uses for Storage: Posters, Blue Prints, Artwork, Maps, Drafts. Perfect for Artists, Illustrators, Architects or Hobbyists! - Dimensions: 24.75 x 3.5 x 3.3 inches Fully extended 40.25"
- Perfect for Artists, Illustrators, Architects or Hobbyists! - Protect, organize and transport your paints, brushes, tools and supplies. - The classic version of the traditional artist's tool box with multi-functional compartments. 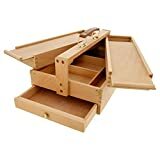 - Two top brush storage slide open trays for easy access to supplies and brushes. - It is light-weight yet sturdy, and it features s full size pull out drawer.